If you want to pinpoint when computer-generated visual effects became mainstream, 1993’s Jurassic Park stands as Ground Zero. Sure, 1989’s Abyss and 1991’s Terminator 2 pushed technological boundaries, but Jurassic Park used the material in a groundbreaking manner that altered movies forever. Because this represents my fourth review of Jurassic Park, I’ll skip my usual movie discussion. If you’d like to check out my thoughts about the film, please click here. To summarize, not only does Jurassic Park stand as a landmark achievement in special effects technology but it also remains a darned fun little film that has kept me entertained over multiple viewings. Jurassic Park has some flaws but they're largely excusable when the overall result is this delightful. Jurassic Park appears in an aspect ratio of approximately 1.85:1 on this 4K UHD Disc. Overall, this became an appealing presentation, though not one without some minor concerns. For the most part, sharpness seemed solid. Occasional softness interfered, but those instances stayed infrequent and usually accompanied heavy effects sequences. Though the film’s CG elements have held up pretty well since 1993, they caused some visual interference and rendered the live-action components a bit fuzzy, especially in daylight shots. This meant lower-light sequences managed to display better definition when CG effects came into the picture. Nonetheless, the majority of the movie provided positive clarity and often seemed pretty terrific in that regard. I noticed no issues with jaggies or shimmering, and edge enhancement was minor. Some light haloes cropped up on a few occasions, but these didn’t create a real distraction. Print flaws remained minor – with an occasional speck on display - and grain fell into appropriate, natural levels. In terms of colors, Park opted for a warm palette that brought out the rich hues of the island. These occasionally threatened to become a little heavy, but they didn’t cross that line in a significant way. Instead, the colors usually appeared pretty vivid and lush. Blacks were deep and dense, while shadows looked smooth and clear. This offered a pleasing – if not stunning - image. I don’t need to use any caveats in terms of the movie’s killer DTS-X soundtrack. While not quite the demo piece this was in 1993, it still offered consistently excellent audio. Downconverted to DTS-HD MA 7.1, the soundstage favored the forward channels and used them in an engaging and effective manner. Imagery spread cleanly and accurately across the front spectrum and the audio blended together nicely. The surrounds kicked in a substantial amount of information, of course, especially during the larger action sequences. Various dinosaurs stomped, roared and attacked all around the room, and different natural and human-related elements – like vehicles – did the same. All of these elements combined together in a smooth manner that formed an engulfing experience. Sound quality seemed strong as well. Dialogue appeared natural and concise, without edginess or other concerns. John Williams' score came across as bold and bright and displayed positive dynamic range. Effects were the highlight of the show, however, as they dominated the film's prominent audio moments. These parts of the mix sounded clear and crisp and didn't display even the slightest hint of distortion, no matter how high the volume went. When one considers just how loud that T-rex roar could be, this fact seemed fairly remarkable. The track featured some very nice low-end as well, especially during those T-rex moments. The bass seemed tight and pretty well-defined, and it provided a powerful impact. The soundtrack to Jurassic Park doesn't match up with the best mixes that have appeared since its release, but it continues to provide very strong audio that I still felt merited an “A”. How did this 4K UHD compare with the Blu-ray from 2011? The audio boasted a bit more intensity, involvement and kick, whereas visuals came across as somewhat tighter and showed superior colors and blacks. Though I think the 4K could’ve worked better than it did, it still demonstrated a step up from the Blu-ray. No extras appear on the 4K itself, but the included Blu-ray copy comes with a mix of components. Under the banner of Return to Jurassic Park, the disc includes the first three chapters of a six-part documentary. Here we find “Dawn of a New Era” (25:25), “Making Prehistory” (20:16) and “The Next Step in Evolution” (15:03). Across these, we hear from director Steven Spielberg, author/co-screenwriter Michael Crichton, producer Kathleen Kennedy, live action dinosaur creator Stan Winston, art department coordinator/puppeteer John Rosengrant, concept artist/puppeteer Mark “Crash” McCreery, dinosaur supervisor Phil Tippett, full motion dinosaur creator Dennis Muren, dinosaur motion supervisor Randal M. Dutra, director of photography Dean Cundey, production designer Rick Carter, art director John Bell, special dinosaur effects Michael Lantieri, sound designer/re-recording mixer Gary Rydstrom, composer John Williams, and actors Sam Neill, Laura Dern, Jeff Goldblum, Ariana Richards, and Joseph Mazzello. 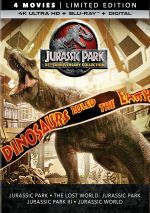 The programs look at story and character topics, dinosaur design and creation, cast and performances, sets and locations, storyboards and shot planning, audio, music and additional effects, and the movie’s reception. “Return” doesn’t provide the world’s most coherent take on the film, but it’s an enjoyable retrospective. It’s nice to get a modern perspective from the participants – something you won’t find anywhere else on the disc – and we learn a lot about the flick here. Hosted by James Earl Jones and created in the mid-1990s, The Making of Jurassic Park runs 49 minutes, 39 seconds and features Spielberg, Winston, Tippett, Muren, Rydstrom, Crichton, Carter, Cundey, Lantieri, Dutra, paleontologist consultant Jack Horner, co-visual effects supervisor Mark AZ Dippe, editor Michael Kahn, computer graphics animators Steve “Spaz” Williams and Eric Armstrong, animator Tom St. Amand, computer interface engineer Craig Hayes, assistant sound engineer Chris Boyes, and computer graphics supervisor Alex Seiden. If you look at that list of participants, you might expect “Making” to focus on technical elements. Good call! Since the “Return” pieces compensate, that’s fine with me, especially since “Making” delivers a pretty “hands-on” examination of the effects and whatnot. The show could still dig into non-technical components better than it does, but “Making” gives us a consistently compelling program. Next we get three vintage featurettes. These include Original Featurette on the Making of the Film (4:50), Steven Spielberg Directs Jurassic Park (9:07) and Hurricane in Kauai (2:09). In “Original”, we hear from Spielberg, Crichton, Richards, Dern, Goldblum, Mazzello, Neill and actor Sir Richard Attenborough. The film snippets dominate this superficial piece that’s really nothing more than a mildly interesting glorified trailer. During “Directs”, the show intermixes movie scenes with shots from the filming of those segments. In other words, we’ll see part of the flick and also check out a little behind the scenes material that directly relate to those areas. At its best, this offers some interesting looks at the shooting of the film. However, the piece includes too many movie clips and not enough candid material. It’s still cool enough to merit a look, but it could have been better. Finally, “Hurricane” includes interview clips with Spielberg, Carter and producer Gerald R. Molen as well as shots of the hurricane that disrupted the filming of Jurassic Park. It’s too short to offer much substance, and it really doesn’t tell us much about what impact the hurricane had on the production. Early Pre-production Meetings presents some technically crude but fascinating information. Videotaped by a locked-off camera that never pans or moves, the focus is on Spielberg but we also see Stan Winston, Phil Tippett and others as they discuss ideas for the development of the dinosaurs as characters. This piece lasts six minutes, 20 seconds but I would have enjoyed hours more. I absolutely love programs of this sort, as they genuinely let us see how the process works. These snippets are brief but fascinating. Also very interesting is Location Scouting, in which we see Spielberg as he inspects potential sights for the exterior production. Actually, we barely see Steve, since he's the cameraman for this one-minute and 59-second piece; I noted a glimpse of him in a mirror as he videotaped the excursion. Anyway, it's a pretty fun little show that allows us further insight into Spielberg's creative mindset. During Phil Tippett Animatics: Raptors in the Kitchen, we see the "go-motion" rendering of this action scene. The three-minute, four-second program combines fairly well-rendered velociraptors with crude dolls for the other elements and provides the basis from which the computer animators operated. It's a cool look at this part of the process, especially since it's fun to see how closely the final product emulated this "dry run". More planning material shows up under Animatics: T-Rex Attack. The seven-minute, 21-second reel lets us see a filmed – though silent – take on the famous scene. While not as entertaining as the “Tippett” piece, this still delivers a cool addition. To get additional behind the scenes material, we head to ILM and Jurassic Park: Before and After the Visual Effects. It goes for six minutes, 32 seconds as it shows five different scenes from the film, and we see the various elements as they become composited to form the finished frames. It’s cool to check out the segments on their own, and we also get a little bit of good candid material in this enjoyable program. Foley Artists offers a brief overview of the work the sound effects personnel complete. We watch Dennie Thorpe as she brings audio to the raptor egg-hatching scene in this one-minute and 25-second piece. Nothing here will be news to anyone who has gone through similar explanations, but it's still a fun look at one of the more interesting and happily low-tech sides of filmmaking. Storyboards provides blueprints for five different scenes. 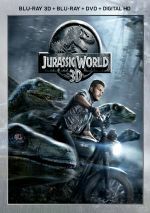 Three of these made the final cut of the film ("T-rex Attack", "Raptors in the Kitchen", and "Jeep Chase"), but two did not. Although all of the boards are interesting, the two altered/omitted segments ("Baby Trike" and "The Original Ending") are clearly the most compelling of the bunch because they didn't appear. "Baby Trike" is a trifle that doesn't offer much, but the "Original Ending" is intriguing; I'm not sure it wouldn't have worked better than the included finale. Inside Production Archives: Photographs, Design Sketches and Conceptual Paintings we find exactly what the title states. There are about 70 stillframes here that show snapshots from the set plus creature drawings and lush artwork created to influence the production design. The section is a little small - there has to be a lot more material than just 70 shots – but it's worth a look. In addition to the film’s trailer, we find Jurassic Park: Making the Game. It lasts four minutes, 43 seconds and delivers comments from Dennis Muren, game executive producer Kevin Boyle, game designers/writers Joe Pinney and Mark Darin, and game director Daniel Herrera. They tell us a little about the game and show a preview. The featurette does nothing more than advertise the video game. After 25 years, Jurassic Park remains a terrific adventure. No, the effects don’t dazzle like they did in 1993, but the action still delights and the movie continues to be a blast. The 4K UHD offers top-notch audio as well as generally good picture and supplements. Jurassic Park remains a fun ride. Note that as of June 2018, this 4K UHD version of Jurassic Park can only be purchased via a four-movie package. The “Jurassic Park 25th Anniversary Collection” also includes 4K UHD versions of The Lost World, Jurassic Park III and Jurassic World.